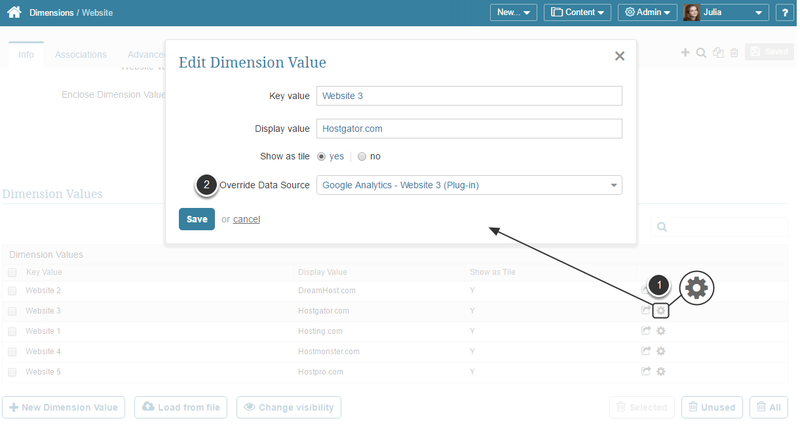 Override Data Sources feature is helpful in case you need to collect data for a single element from several Data Sources of the same type (for example, Google Analytics) simultaneously. If you have a consolidated Data Source where data for all Data Sources is maintained, there is no need to override Data Sources. The same Data Source can be used for all Dimension Values in that case. 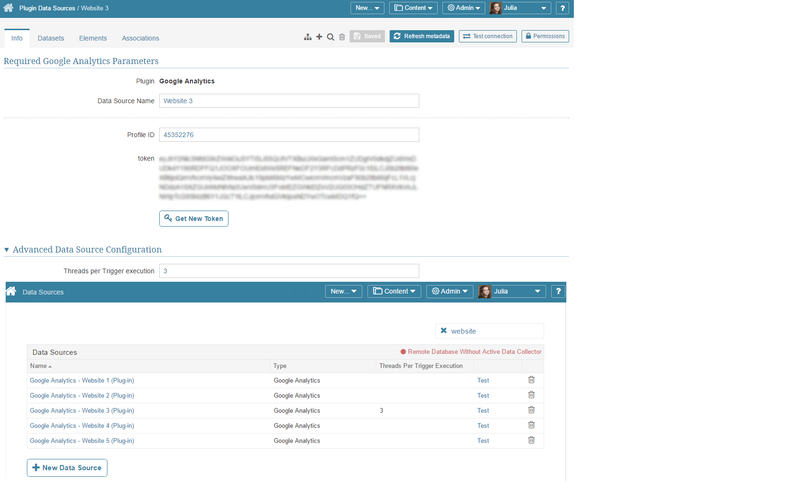 This solution is simpler since a single Dimension can be used for all Metrics and Reports. The setup process covered in this article is applicable for account-based Data Sources where you want to provide a similar kind of dimensioned access; for example, to Facebook. In that case, you'll need to create a Dimension named 'Facebook' with separate accounts presented as Dimension Values and plug-in based Data Source to be used as a Override Data Source for each Dimension Value. The following example is based on the assumption that you need to create an 'Hourly Website Visitors' Metric to measure traffic on five different websites simultaneously using Google Analytics as Data Source. The Add Dimension pop-up opens. 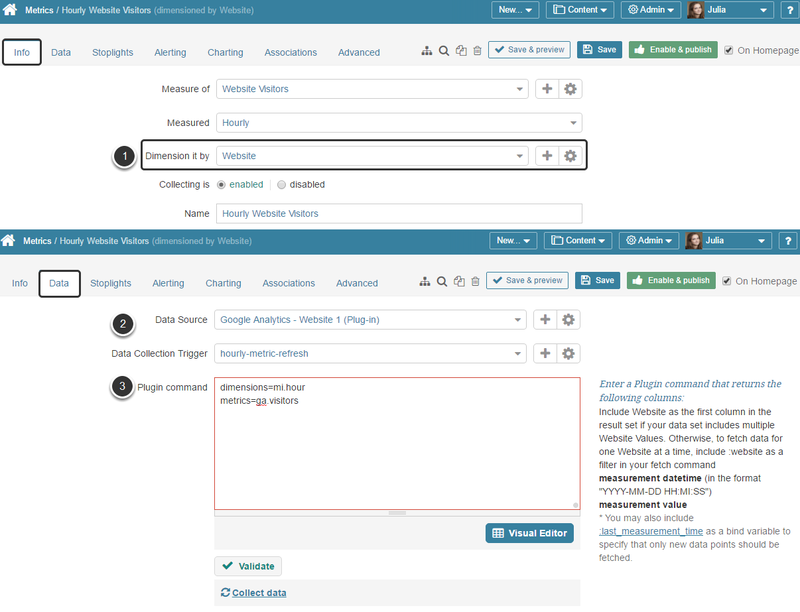 Originate a new Dimension as shown in the example above. NOTE: The Override Data Source setting is only available on the Edit Dimension Value pop-up when you have set Issue a data fetch command for to 'Each Individual Dimension Value'. 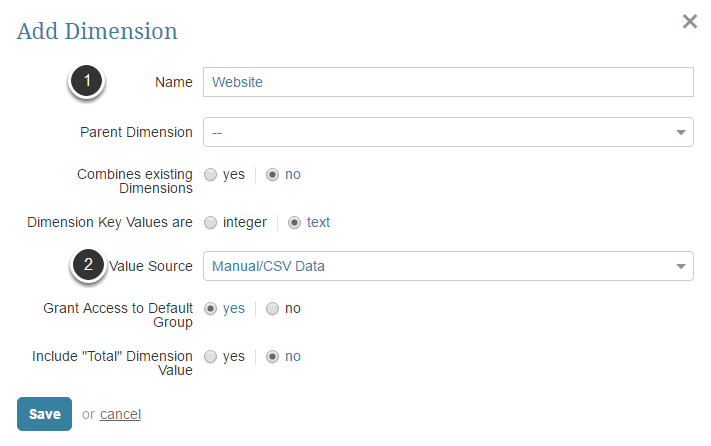 'Bulk' dimension fetches cannot be configured with an Override Data Source. Dimension it by: Choose the Dimension created in Step 1. Plug-In Command: Write the command as if you were fetching data for only a single Dimension Value. NOTE: The Dimension bind parameter should not appear in your fetch command. Grant this Group access to the created Dimension with one or several Dimension Values (in our example, data collected from one or several Websites). The Group settings described below are optional. They are only required if you want to restrict access so that data collected from a specific Website is only available to members of this Group. 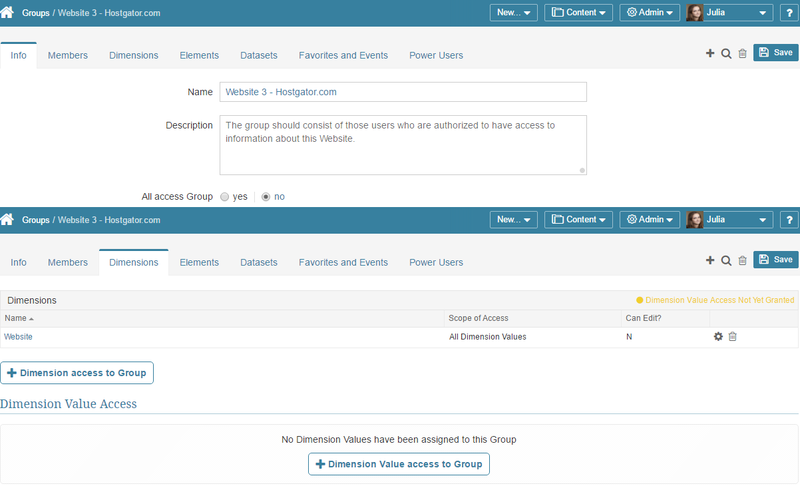 You can assign new users to this Group in the Members tab and authorize access to specific Dimension Values in the Dimensions tab.